Almost every tourist in Vienna makes it to the Hofburg Palace and the Heldenplatz, the large and pompous parading mall in front of it. Most tourists know or they are told at some point that the president of Austria resides in the Hofburg. What many don′t realise is, that the president is only the head of state - unlike in the US, he has almost only representative duties. The head of the government in the sense of a prime minister is in fact the Bundeskanzler or Chancellor. For details, read my article on politics and administration of Austria. The official site where the Chancellor and his staff reside is the Bundeskanzleramt in the Ballhaus building just facing the Hofburg. It is a somewhat oddly shaped, Baroque palace between the Leopoldinertrakt of the Hofburg and the Minoritenkirche Church. The name "Ballhaus" means "ball house" (surprise), but one could easily think of formal balls in the sense of a social event with dance and drink, looking at the palatial appearance of the building. In fact, the Ballhaus′ name was derived from ball games that Emperor Ferdinand I introduced to Vienna in the early 16th century. Originally, aristocrats of Spain had played ball games, but within a short amount of time, ball games had become hugely popular among the Austrian nobility, too. 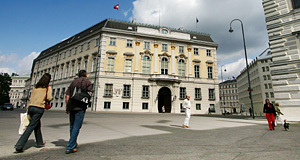 The first Ballhaus was built behind today′s Amalientrakt wing of the Hofburg. The last one of Vienna was built under the rule of Empress Maria Theresia and demolished in 1903 in the course of the Hofburg′s re-development. The surroundings of today′s Ballhaus, a Baroque 18th century design by Lukas von Hildebrandt, were orininally used by the Minoritenkloster Monastery. Finally, the monk′s buildings were gradually replaced by Baroque Palais, most of which serve as administrative headquarters to some of Austria′s most important ministeries. This includes the ministery of foreign affairs and the ministery and education and research. It is due to these institutions that the word "Ballhausplatz" (the square where the Ballhaus can be found) is synonymous with "government". Therefore - and because demonstrations are prohibited near the Houses of Parliament - the square is a popular "venue" for political protest events. Attractions nearby include the Palais Ferstel, the Freyung and the BA-CA-Kunstforum, the Am Hof Square with the Zeughaus, the Burgtheater and the Pasqualatihaus. The Michaelerplatz with the Michaelerkirche and the Kohlmarkt area around the corner from the Ballhaus.